The Accusation is thought to be the first fiction published abroad by someone still living in North Korea. In fact, this is the only fiction we found written by a North Korean author period. Smuggled out of the country in 2013, this work of fiction is a dystopian thriller. But the book is no fantasy. It’s the reality for 25 million people living out unparalleled human rights abuses in North Korea today. 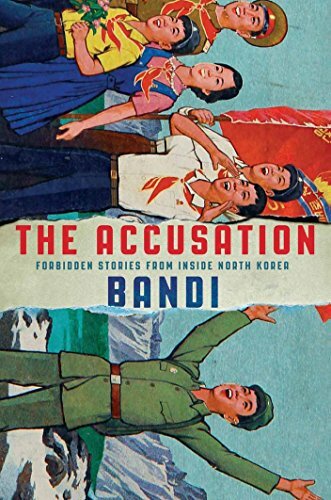 "The Accusation is a deeply moving and eye-opening work of fiction that paints a powerful portrait of life under the North Korean regime. Set during the period of Kim Il-sung and Kim Jong-il’s leadership, the seven stories that make up The Accusation give voice to people living under this most bizarre and horrifying of dictatorships. The characters of these compelling stories come from a wide variety of backgrounds, from a young mother living among the elite in Pyongyang whose son misbehaves during a political rally, to a former Communist war hero who is deeply disillusioned with the intrusion of the Party into everything he holds dear, to a husband and father who is denied a travel permit and sneaks onto a train in order to visit his critically ill mother. Written with deep emotion and writing talent, The Accusation is a vivid depiction of life in a closed-off one-party state, and also a hopeful testament to the humanity and rich internal life that persists even in such inhumane conditions." 1. This work of fiction is unique & we found no other genres aside from memoirs. 2. The author was born of North Korean parents. 3. It seems likely that the author moved to North Korea as a baby. A special thank you to book club member, Aisha Esbhani for the suggestion and Yeonsang Cho, who lives in South Korea, for her impassioned plea to include this important work.